An illustration on DARPA's website outlines its concept for a prize competition for small, responsive launch vehicles, to be announced in April. WASHINGTON — The Defense Advanced Research Projects Agency, which has a checkered history of supporting development of new launch vehicles, is planning to start a competition offering prizes for responsive launch systems. The DARPA Launch Challenge won't be formally announced until April, but Fred Kennedy, director of DARPA's Tactical Technology Office, said it is part of an effort to harness growing commercial capabilities to address threats to national security space assets. One approach for doing so is a prize competition DARPA is developing for responsive launch, intended to foster the development of vehicles that can launch on short notice and from a variety of locations. "I want to do something like 'Orbitz for orbits,'" he said, referring to the online travel service. His vision is an online booking service where he could select an upcoming launch going to the desired orbit and with the desired capacity. "I can't do that today. I have no way to accomplish that. But yet, I see emerging in the small launch industry the ability to do just that." Kennedy said details about the competition, including the specific rules and the prize purse, are still being developed. An illustration he showed at the conference, and which is available on the DARPA website, shows a competition where a company launches one mission after being called up for it "days to weeks" in advance, then repeating that launch again on short notice but from another site and to another orbit. 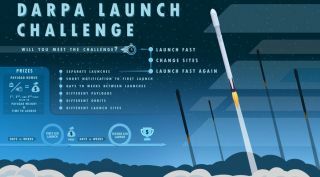 The illustration also suggests there will be first, second and third prizes based on the payload weight and time to launch, but does not state the size of those prizes. Kennedy said he consulted with the FAA, who would be responsible for licensing those commercial launches, before deciding to proceed with the competition. DARPA has run a number of prize competitions in the past, including the DARPA Grand Challenge that helped advance autonomous driving technology more than a decade ago. It has also held prize competitions in robotics and cyber technologies. DARPA has also been involved in launch vehicle development itself, but with less success. The agency is currently funding Experimental Spaceplane 1 (XS-1), a reusable first stage designed to be used with an expendable upper stage for low-cost launches of medium-class payloads. DARPA issued an award to Boeing last year to develop XS-1 with test flights planned by the end of the decade. Previous DARPA launch projects have in many cases failed to get off the ground. Concurrently with XS-1, DARPA supported a project called Airborne Launch Assist Space Access(ALASA), intended to develop a rocket that could be launched from an F-15 jet for payloads weighing less than 50 kilograms. Boeing was also working on ALASA, but DARPA converted the program into a ground demonstration effort because the unusual mixed monopropellant used for the rocket turned out to be unstable. In the early 2000s, DARPA's Force Application and Launch from Continental United States (FALCON) program studied the development of low-cost small launch vehicles as part of a broader effort to work on hypersonic weapons systems. DARPA did not pursue the development of the FALCON launch system but did award study contracts to several companies, including SpaceX, who at the time was developing its Falcon 1 launch vehicle. DARPA also supported the launch of the first two, albeit unsuccessful, Falcon 1 missions.